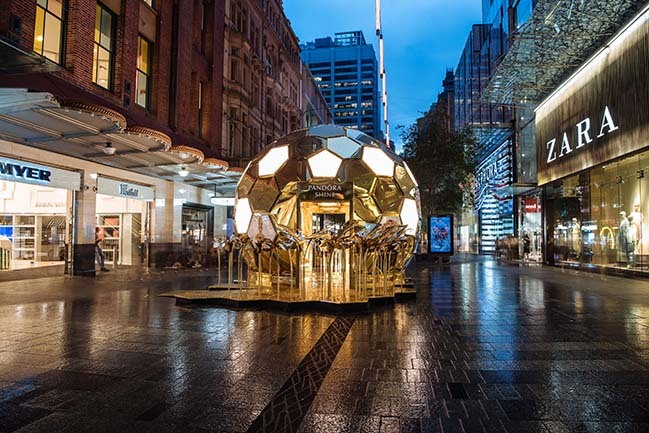 Danish jewellery brand PANDORA have partnered with Melbourne experience design agency YourStudio to create a engaging multi-sensory retail store to launch their new collection PANDORA Shine. 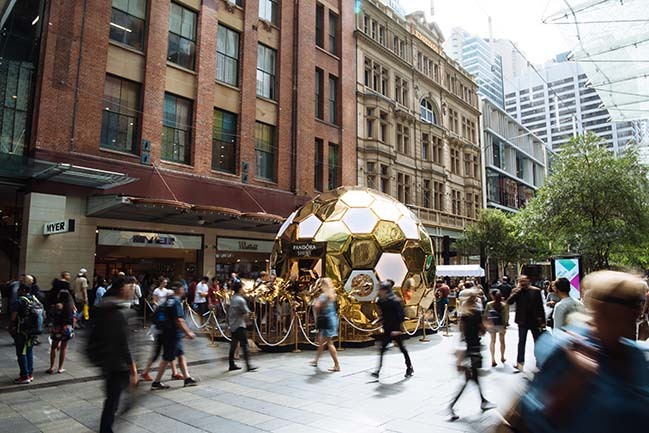 YourStudio conceptualised a beehive to create energy and excitement in Sydney’s Pitt Street Mall, and also to showcase the beautiful product using geometric shapes and gold tones. 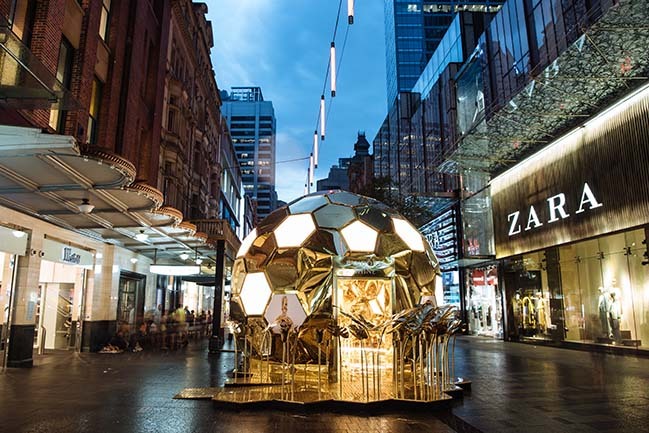 Taken cues from PANDORA’s geometric honeycomb charm design, YourStudio have designed and built an immersive 5 meter high installation called ‘The Hive’ to replicate a working beehive. 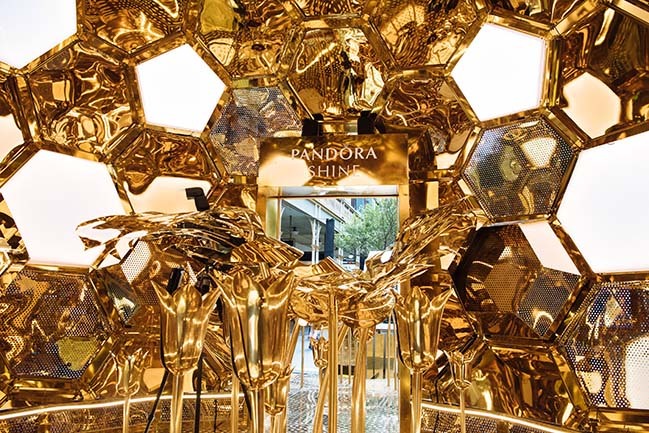 This includes ‘Humming Hubs’ that incorporate scent and sound, LED light panels that mimic the movement of bees and the Pandora product housed in the scent-infused stigmas of gold-plated flowers to create a genuine multi-sensory experience. The customer has been put at the heart of the experience, engaging all senses for this dramatic launch of the new product line by PANDORA. 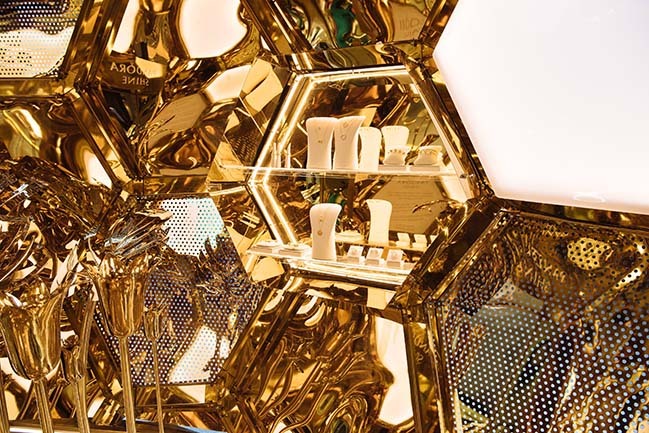 As you can see- we’ve created a giant hive, but not only has it been designed as this super-glossy and alluring object, there’s a story about the bee and the hive that plays out through the customer journey. PANDORA have evolved from a charm-based company to selling a wider spectrum of jewellery. Their customers, from the Gen Z girl first interacting with the brand through to the millennial who has already purchased, what we know is they want more. They want to feel an emotional connection to the brand’s they buy into, a sense of being part of a community that knows them. The Hive attracts the customer like a pollen does to bee. The customers are drawn in by the scents of a meadow which is positioned around and through the hive. The gold flowers emit a meadow fragrance, attracting customers passing-by. As they approach they get the alluring visual impact, that shines like a Jewel. The honeycomb floor provides the perfect stage for the immersive hive. Once inside the customers can marvel at the honeycomb structure, be immersed in the humming hubs with the smells of honey and the rhythms of a working hive. As you walk around the hive and smell the flowers, discover the products as you lean in to get a closer smell, they reveal themselves inside the flowers like a bee collecting pollen. 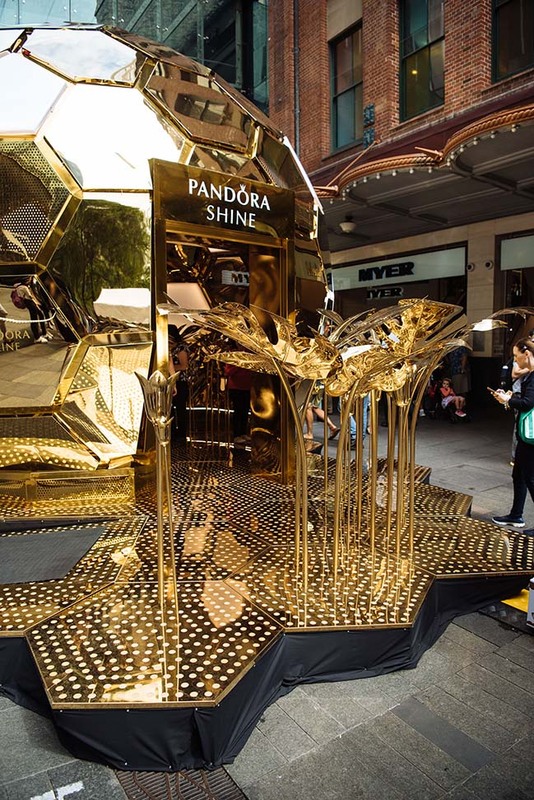 Visitors can share their experience using the #PANDORAShine hashtag on social media and take photos at the PANDORA Shine-themed gif booth in the Hive. 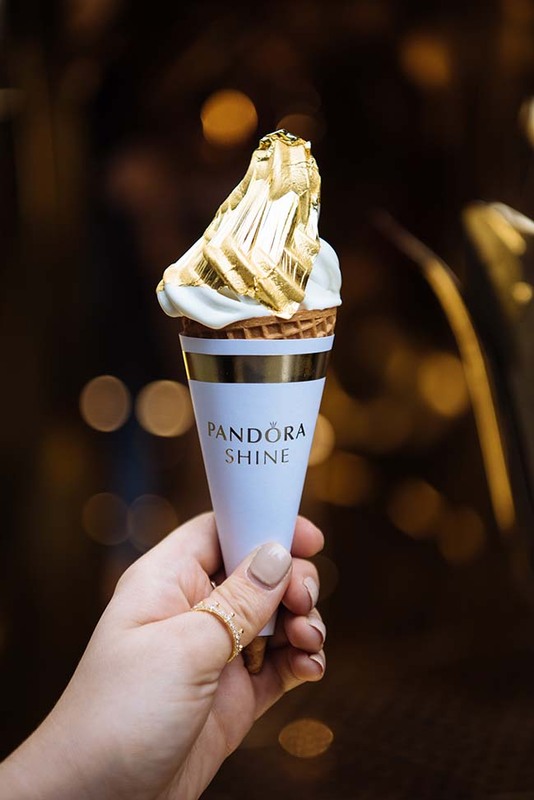 As the customers leave, they will be handed ice creams made from edible gold, the perfect reward for all the Pandora bees. 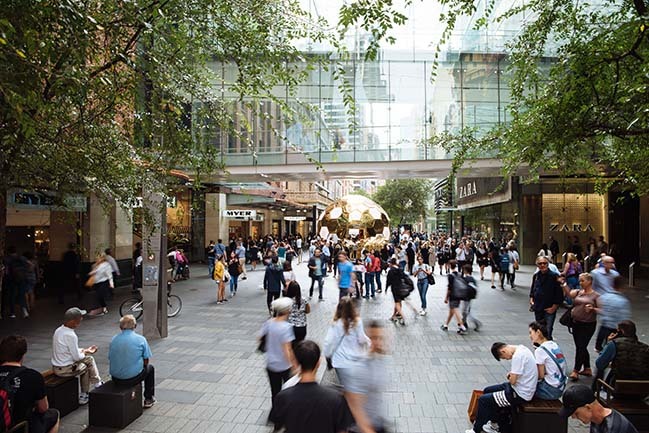 “We wanted to bring the PANDORA Shine campaign to life in a way that engages all the senses,” says Glenda Wolman, Vice President, Marketing for PANDORA in Australia and New Zealand. “This is an exciting launch for the brand, representing the next step in the brand’s evolution. The PANDORA Shine collection, in 18k gold-plated sterling silver, takes inspiration from nature and honeybees. 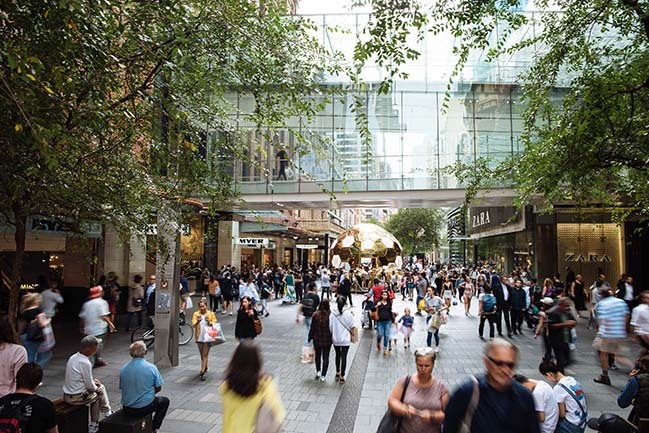 The Hive is the perfect way to introduce our new jewellery collection to the Australian market in an innovative and engaging way,” she says. "We create human experiences that connect people through sharing and making memories together, this is a perfect example of this. 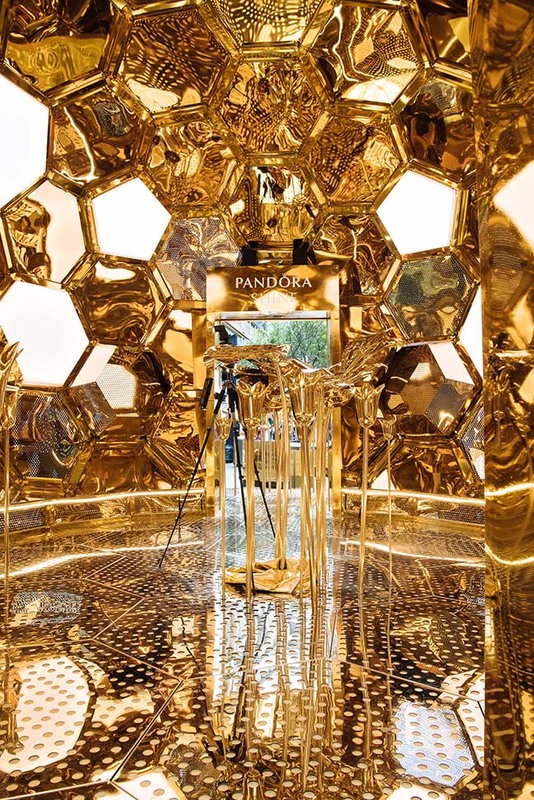 PANDORA’s Hive is an immersive, multi-sensory installation showcasing the new PANDORA Shine collection in a really unique way. ," says Danny Newman from YourStudio.